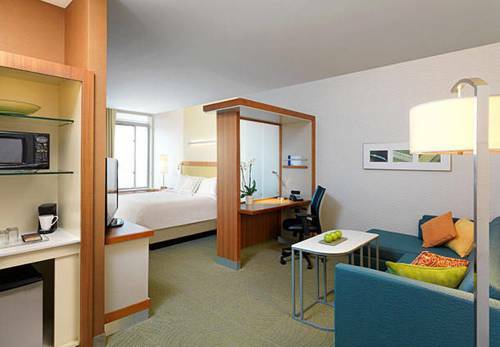 Comfort and convenience come together at SpringHill Suites Houston Northwest located near the Hewlett Packard Campus. Enjoy an exceptional night's rest with crisp linens, custom comforters and fluffy pillows. Blending business with leisure is effortless in our hotel suites with well-lit workspaces, ergonomic seating, microwaves, refrigerators, free high-speed Wi-Fi and large flat-screen TVs. Once you're settled in, jump-start your mornings with our hot breakfast buffet featuring favorites like hearty eggs, a variety of cereal and pastries. In the evening we offer a convenient lobby bar, the perfect place to start the night. Run, swim or lift in our recreational outdoor pool and 24-hour fitness center with cardio equipment and free weights. While you stay with us, be sure to visit popular destinations like Willowbrook Mall and Vintage Park for a plethora of desirable stores and boutiques. Whether you're traveling for work or leisure, SpringHill Suites Houston Northwest is your option for a delightful stay.